Kata kunci: Anti-corruption, corruption, theology, commanding the good and forbidding the evil. This article wants to present a reconstruction of theological thought of Hasan Hanafî as a base idea of contextual-ization to the problem of corruption in Indonesia. Theology of Hasan Hanafî is the liberative theology which direct human to make the teaching of theology as the spirit of value in life. So that all the problems of life, in particular corruption taking root in Indonesia can be resolved properly through the building of anti-corruption theology. The urgency of anticorruption theology, is a manifestation of a communal dream about a developed and prosperous Indonesia. Moreover, as a shared commitment of Muslims to show the world that Islam is truly a mercy to the worlds, which moves its adherents to really be able to implement commanding the good and forbidding the evil. Masduri, Masduri. 2014. 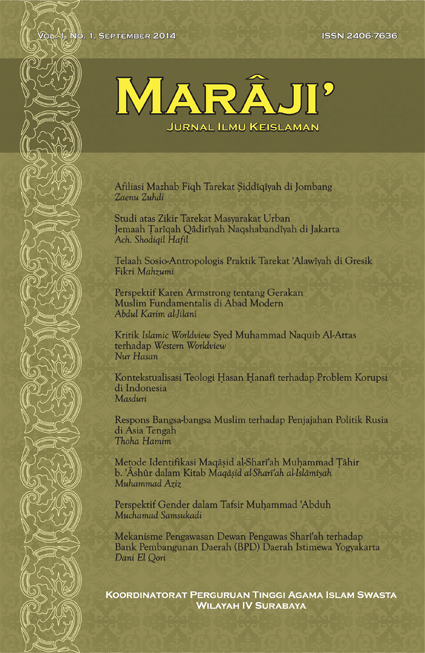 Marâji`: Jurnal Ilmu Keislaman 1 (1), 146-80. Accessed April 18, 2019. http://maraji.kopertais4.or.id/index.php/maraji/article/view/14.